Events of the Year – only 2 really matter- Brexit and Trump winning. Most obvious appointment - Theresa May as PM: a strong woman for a difficult time. Mistake of the Year – Labour not getting rid of Corbyn. Comeback of the year - Balls again. Now the most popular labour politician ... a commons comeback beckons for my nemesis? Political Achievement of the Year – Jeremy Corbyn is the only political mainstream leader to survive since summer 2015. Pretty impressive as he was the only mainstream leader who opposed Brexit, and 172 of his own MPs led a campaign against him. Odds on Corbyn being labour leader after 2017? Pretty good I reckon, although the mechanics are difficult. The longer the labour MPs leave him there the greater their prospects of problems. Best unsung heroes of backbenchers in the House of Commons: for labour Chris Matheson, the labour Chester MP is very good, and I spent time with Pete Dowd, who is a decent man with a lot of Local Authority experience. It remains amazing so many of the other labour stars are unused as they are out of favour with Corbyn. On our side Andrew Stephenson and Graham Evans, the MPs for Pendle and Weaver Vale, are consistently outstanding in the chamber, great PPSs, and good people. All of my flock are amazing but both go the extra mile. Hard to think of a liberal star, but given their lack of numbers and dislike of the house of commons [they are never there] it is not surprising. For the SNP Hannah Bardell MP remains their best rising star. Of the Irish, Danny Kinahan MP is hard working, a nice bloke and very empathetic. · Employment is up in the North East by 74,000 since 2010. That’s 74,000 more people who are earning a regular wage and are better able to provide for their families. · Unemployment is down in the North East by 35 per cent since 2010. That’s fewer people out of work and more who now can get on in life and have the confidence to plan for the future. · In 2016 there were 24,410 more small businesses in the North East compared to 2010 – providing more people with the safety and security of work. We are backing businesses and creating jobs. · Over 1 million more people have more money to take home each month because we have cut their income tax. The typical taxpayer is better off by £905 and 56,000 people will have been taken out of income tax altogether by April 2017. · Freezing fuel duty saving drivers in the North East money at the fuel pump. Freezing fuel duty for the seventh successive year, which will save the average driver in the North East £10 every time they fill up the car. · 38,210 apprenticeships started in the North East in 2015/16– meaning thousands of young people can gain the skills they need to get on in life. · 46,000 more children attend good or outstanding schools in the North East since 2010. · We are providing over £140 million in education funding for disadvantaged children in the North East – so they can get a decent start in life. In 2016/17, schools in the North East will receive over £140 million Pupil Premium funding. · There are now 1,100 more hospital doctors looking after patients in the North East than under Labour, ensuring that people receive the care they deserve. · Investing up to £556 million to boost productivity and promote growth and jobs across the North of England. The government’s investment in infrastructure will result in an increase of £556 million to Local Enterprise Partnerships in the North of England. o Work with Northern city regions to explore options for improving Early Years outcomes, attract and retain high quality teachers, improve schools and grow capacity. o Support Northern city regions to work with employers and providers to promote uptake of high quality local apprenticeships, and ensure careers advice is employer-led, integrated and meets local needs. o Work with Northern city regions to develop innovative proposals for attracting skilled workers. o Upgrade the A66 across the Pennines to dual carriageway to improve east-west connectivity, and work to improve the A69 in the short and longer term. o Support enhanced collaboration between universities and businesses in the North to develop a business incubator and commercialise research. · Boosting important causes in the North East with the money from LIBOR fines. The Government will use LIBOR fines to provide nearly £1,462,093 funding for good causes across the North East. · Doubling rural rate relief to support small business in rural areas. To remove the inconsistency between rural rate relief and small business rate relief, we will double the rural rate relief to 100 per cent from April- benefitting 210 properties in the North East. · Boosting science, research and innovation in the North East. Our £2 billion R&D funding package will provide new opportunities to the North East’s thriving universities and research centres. Successful politics requires an unsentimental readiness to identify the problems of today, not yesterday. Margaret Thatcher fought inflation, union power and Soviet communism. Tony Blair sought to combine economic efficiency with social justice. In 2017, the challenges are no less specific: globalisation (opportunities and discontents); Islamist and far-right extremism; the cult of autocracy fuelled by populism; climate change; the consequences of human longevity. Be uncompromising in your focus. Don’t let the other side frame the debate. Nick Boles MP and I have worked together for 6 1/2 years and he was an outstanding Minister. He is now off work struggling to overcome a serious brain tumour. I wish him well. 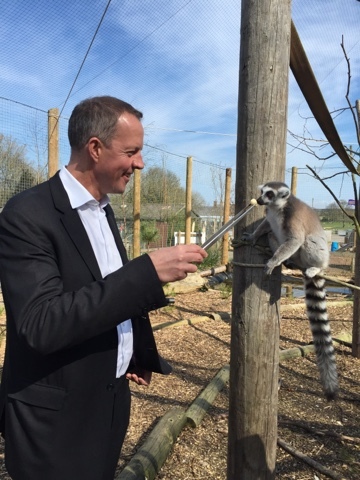 Our trip earlier this year saw us plant a tree, discuss the huge progress MP being made in FE and with UTCs and then on to the Kirkley zoo and the lemurs. His illness, and its unfairness has affected a lot of people in Westminster. And it puts everything else into context. - a sense of resilience and a "Can do / making it work" approach post Brexit has been really noticeable from businesses, and from talking to people when out and about. There is no doubt that politics has become more divisive, more bitter and angrier. I saw this in America when I observed the American election, and I saw it in the Brexit campaign. This culminated in the killing of Jo Cox. The campaign itself was messy and divisive. We are all brexiteers now, and I am certain we will make this work as a country, but this will take time to heal. It is North East scientists who have developed this cure to this terrible illness. This biotech success story was one of the most important debates in the last parliament and we are slowly getting there. The impact of this and other science based developments only enhance the North Easts place as a serious player in science, biotech, and innovation. This is good news for jobs, science and so much more - for the future of our universities, for funding and most importantly the mums who want children who will not have this terrible disease. Last Thursday 15 December 2016, the Human Fertilisation and Embryology Association (HFEA) announced their decision to licence mitochondrial replacement therapy as a reproductive technique to allow families affected by mitochondrial disease to conceive a child free from the condition. Problems with mitochondria cause many serious, rare, childhood conditions. As this tragedy has unfolded, the Government has sought to reduce the suffering with every diplomatic and humanitarian lever at our command. Indeed, the Foreign Secretary made very clear at the emergency debate that was held on 13 December on Syria that the UK’s first priority must be the protection of civilians and ensuring access for humanitarian aid. The Foreign Secretary also made it patently clear that there can be no military solution in Syria; I agree with him. Britain must keep pushing for a return to a political process with the credibility necessary for all parties to commit to an end to all the fighting. Despite serious obstacles, there have, nonetheless, been several successful evacuations of civilians over recent days. I hope that this continues, and that the UN is able to oversee more evacuations in the near future to ensure the welfare of civilians. Yet, it is essential that the Assad regime and its supporters provide the United Nations with access for humanitarian aid with immediate effect. Whilst the deterioration of the situation in Aleppo is a setback for the Syrian opposition, it will not change the fundamentals of the conflict, nor the requirement for a political as opposed to a military solution. I hope to explain why this is the case, drawing on what the Foreign Secretary explained in the House of Commons a couple of weeks ago. Firstly, the UK has utilised every avenue for action at the UN. You will recall that, back in December 2015, Russia voted in favour of UN resolution 2254, which urged all parties to “allow humanitarian agencies rapid, safe and unhindered access throughout Syria”. Russia has now chosen to flaunt the very resolution that it supported. On 8 October this year, we tried to secure a new UN resolution that would have urged a ceasefire. It demanded that “all parties immediately end all aerial bombardments of Aleppo” – a resolution that was vetoed by the Russians. On 5 December, we tried again, throwing our weight behind a draft resolution that urged a seven-day ceasefire in Aleppo to allow the evacuation of casualties and the delivery of aid. Once again, Russia vetoed the resolution, as did China. Russia and China would not even allow the people of Aleppo a mere seven-day respite. Moreover, the Russians have been blocking the evacuation of the injured and of medical staff from the very zones they are attacking. We are gathering all the information that we think will be necessary for the prosecution of those guilty of war crimes but, as the Foreign Secretary said, “the diplomatic pressure must continue”. The UK stood up at the last meeting of the Foreign Affairs Council and argued for tightening sanctions against Russia in respect of Syria, and the Foreign Secretary stated his wish that the rest of the EU follow suit. In addition, the Foreign Secretary recently met with the US Secretary of State, John Kerry, in Paris to discuss this matter. They demanded, jointly, that the “regime and its backers” allow the UN to deliver aid “with immediate effect.” On this, the Foreign Secretary reported back to the House of Commons that “Assad has doggedly refused to allow the UN to deliver supplies to hundreds of thousands of people, many of whom are now starving. He is content for his own people to be reduced to starvation, even though there are UN warehouses full of food within easy reach.”Let it not be forgotten that, in spite of all the constraints that we are facing, the British Government continues to be at the forefront of the international response to the humanitarian crisis in Syria. The UK is the second largest bilateral donor of humanitarian aid, having already pledged £2.3 billion. Some £105 million of this funding will help Syrians who are still in Syria. However, after being studied with great care, it has become clear that there are some harsh realities that must be accepted. For air drops to be accurate, they must be conducted at low level and low speed. Russia has deployed its most advanced jet fighters and surface-to-air missiles in Syria, which makes it impossible for us to carry out air drops without Russian permission. Even if Russia were to give its consent, our aircraft would still have to fly over areas of Syria that are hotly contested by a multitude of armed groups, including Assad, Daesh and al-Qaeda. They would make every effort to shoot down a British plane, and a lumbering, low-flying transport aircraft would be a sitting duck. Reluctantly, the conclusion was reached that air drops over Syria, under those conditions, would pose too great a risk. As things stand, we would be risking the lives of our air crew if we tried to drop supplies into eastern Aleppo. Primarily, it is up to the Russians and the Assad regime to institute an immediate ceasefire. When it comes to drones and other devices, we still face the problem that the Syrians and the Russians control the airspace. Of course it is possible that circumstances might change, so the Foreign Secretary did not explicitly rule out any option for delivering aid at some point in the future. However, there is another inescapable reality that must be accepted. On 29 August 2013, the House of Commons voted by 285 to 272 votes not to use force against Assad, even after he had poisoned hundreds of his people with sarin nerve gas. We, as a country, thereby vacated the space into which Russia stepped, beginning its own bombing campaign on behalf of Assad in 2015. Ever since that vote, our ability to influence events in Syria, to protect civilians or to compel the delivery of aid has been severely limited. We will continue to do what we can but this is a conflict in a country over which we have minimal control so long as these opposing forces exist and the UN is powerless . My colleague for the last 6 1/2 years, Jamie Reed, was a Blairite; a modernising Labour politician. He has decided to stand down as an MP. Jamie has stood down for a number of reasons - many of them personal, and entirely understandable with a young family. But there are other reasons too - just as other Labour MPs have decided to do other jobs in Manchester, London, or in select committees, or are considering packing it all in either now or at 2020. - and have no confidence in Corbyn forming a government. There are similar colleagues in the North East. If I named them they would be the subject of a torrent of abuse by their "new" Momentum members. It is very sad to see where the Labour party has got itself. The finalists in the Countryside Alliance Awards, otherwise known as “The Rural Oscars”, have been announced. The Awards are distributed in six geographic regions, and in the North region there are 3 businesses from Hexham that are in contention for a regional title. North Acomb Farm Shop is one of four Northern regional finalists in the “Butcher” category, Northumberland Honey + Sovereign Nectar Meadery in Haltwhistle is one of four in the “Local food/drink” category, and Blanchland Post Office is one of five in the “Village shop/Post Office” category. The Awards are an annual celebration of rural produce, skills, enterprise and heritage through our small hard-working businesses. This is now the twelfth year that the Rural Oscars have been awarded, and it has become the definitive and most prestigious rural business award to win. The Awards have successfully highlighted the diversity of rural enterprise and the determination of rural communities to survive and prosper, often against the odds. This year, over 7,500 nominations were received across the country, meaning these finalists really are the best of the best. It is clear, therefore, that these 3 outstanding small businesses in Northumberland are truly appreciated by, and important to, local communities. Each business that has reached regional finalist status will now be visited by the judges. Regional winners will be announced in February, and will then advance to compete against other regional winners in their respective categories in the national finals. There will be a winners’ reception held at the House of Lords in London on Wednesday 22 March 2017, where the overall national winners of each category will be announced. I am so proud that we have three of the Northern regional finalists, and I am sure that all of you will join me in wishing them the very best of luck in the further stages of the competition. I will be in Westminster most of this week, although the House of Commons formally rises for Christmas recess on Tuesday. Today in parliament we have an extended debate on the impact on science and research upon exiting the EU, and what measures he government should put in place to ensure the continued success of the uk in these fields. I have a meeting at the Department for Transport in support of cycling in Northumberland, and a variety of other meetings today. Haydon Bridge High School - Where possible I believe we should keep open and support local schools rather than close them. Where possible I believe we should keep open and support local schools rather than close them. I have seen the difference the teachers and support from Bright tribe have made at the Haltwhistle campus and the Haydon Bridge High School, and I believe they should be allowed to continue the job of turning these schools around. One of my abiding memories is learning that Allendale Middle School was going to be closed in 2013 by the Northumberland County Council, when I read it in the Hexham Courant. There was no warning, or even discussion with the elected MP. That move has had a knock on effect ever since, where the NCC effectively forced a two tier system on schools in the West of Northumberland, meaning a split mixed system of 2 and 3 tier in tynedale. I have spoken at length to parents, pupils, teachers, and local Haydon Bridge community leaders over the last 48 hours. I spent Friday and parts of Saturday in Haltwhistle and Haydon Bridge. I went, once again, to Haydon Bridge High School on Friday morning. I can only be honest and say that nobody I spoke in the last 48 hours supported the County Council's proposal to close the school. The alternative is to keep Haydon Bridge High School open with a sponsor in Bright Tribe. I have visited both of Haltwhistle and Haydon Bridge schools and met with teachers, pupils, and parents and more at both schools since Bright Tribe became involved. There is a big collective effect that has gone on by everyone, but some people deserve to be named. I have been very impressed with the difference that they and their outstanding key teachers are making at both the first and middle schools in Haltwhistle. The change in the school, the change in the pupils, and the measurable statistics since their arrival are clear. I have spoken to many of the pupils and parents and they are delighted in the change. It is all hands to the pump, but you do need good leaders. So special praise is due to the new upper school head, Paul Sampson and the new lower school head Susie Drake, at Haltwhistle. Likewise, Mrs Helen McCormick, Acting Headteacher, and Mr Darren Glover, Consultant Headteacher (Bright Tribe) at Haydon Bridge. Dr Judith Greene is the executive principal for both schools;she has an outstanding track record and she and her team are passionate about improving education in the west. There is no doubt that this last term Haydon Bridge High School is working way better than before. Teachers are more organised and lessons are better planned. Pupils are definitely happier. Attendance figures are better. Problems with some pupils behaviour has been resolved. It is my understanding that the original plans to keep Haydon Bridge High School open with Bright Tribe as its sponsor are well advanced and continuing. The County Council allowed Haydon Bridge High School to get itself into difficulties, I believe Judith, Darren, Helen and the Bright Tribe support team can sort this school out based on what I have seen, heard, and the measurable stats. The alternative proposal by NCC to close Haydon Bridge High School, and Ridley Hall, and move 500 pupils and teachers to Hexham onto an already cramped Hexham QEHS site with no spare classroom capacity is a massive undertaking. And all this in 9 months? My view is simple; I believe we should keep open and support local schools rather than close them, and I have seen first hand the positive difference the new team brought in by Bright Tribe are making in supporting Haydon Bridge and Haltwhistle. The key thing now is we hear from the staff, pupils and parents at all the affected schools. I will update when I know more from the Northumberland County Council. I wanted to update constituents on some developments that are happening in our local schools, with especially good news to report about Whitfield Church of England Primary School. I will blog separately on the Fairer Funding settlement, and the issues on other bigger schools, but this blog is focused very much on first and primary schools. As always, I would make the point that I do not run the schools - that is the responsibility of the Northumberland County Council, save when the schools go into special measures. Sometimes I do wish I did run the schools. I do, however, do all I can to help the individual head teachers, governors, parents and pupils in whatever way I can. I have over 45 schools in my area and am in regular contact by visits and phone conversations with many of these. As always, my door is open. Whitfield Primary has clearly had its problems over the last two years, but I am now 100% confident that the school will survive, will be open in September 2017 and beyond, and also prospering. The new academic year has started very brightly. There is a new team of Governors, led by Mrs Amanda Stembridge, who are clearly working really well together. Whitfield Primary now has an Academy Order in place, and The Good Shepherd Multi Academy Trust has been approved as a sponsor. The Good Shepherd has experience running four other Church of England Primary Schools in Cumbria. While there is still work to be done before Whitfield Primary formally opens as an academy (likely to be in Spring 2017), the school will be able to draw on The Good Shepherd’s resources, expertise and support, whilst also ensuring it stays true to its desire to serve the needs of local families and their children. The Adderlane conversion went ahead as planned on 1 December, into WISE Academies. There is no doubt that the team at the school, who I have met, have worked really hard to make this transition work. They have a good partner and are optimistic for the future. I have met the team at Adderlane earlier this year and they have worked really hard to turn the school around and I am delighted for their Headteacher, Emma, the parents and the pupils. I visited there for a morning about ten weeks ago - there is no doubt that the new teaching team are doing a fantastic job. The pupils were happy, focused and well led by the teaching team when I visited. I am going back there v shortly. This week the House of Commons debated Aleppo, and all the conflicting choices, or lack of them ,that are available to concerned western powers who wish to stop the fighting. It is easy to say that something must be done. I know of no one who does not wish to see an end to the bloodshed. But any action requires putting british airmen potentially in harms way, even if they are attempting merely a drop of humanitarian supplies. "I congratulate my right hon. Friend the Member for Sutton Coldfield (Mr Mitchell) on speaking with such passion and compassion for the citizens of Aleppo, and on bringing to bear his experience as one of the country’s outstanding International Development Secretaries. I also thank you, Mr Speaker, for granting this debate; it is good to see my right hon. Friend the Foreign Secretary here to respond to it. What we have heard already moves us to tears: the tens of thousands of civilians trapped in Aleppo; the reports today of residents being shot on sight; and the barbarous assault by the Syrian army, Iranian militias and Russian airpower that the Morning Star, as we have heard, describes as a “liberation”. Let me offer my support and gratitude to the incredibly brave people who are risking their lives as doctors and White Helmet workers in that war zone. I support everything that has been said about what we need to do to get aid into Aleppo, or to provide some kind of ceasefire so that civilians can get out of Aleppo. The whole concept of an emergency debate suggests that this tragedy has somehow come upon us out of the blue and that there is an almost natural aspect to it, but that is not the case. The Syrian civil war has been waged since 2011, so this is something that we could have foreseen and done somethingabout. We are deceiving ourselves in this Parliament if we believe that we have no responsibility for what has happened in Syria. The tragedy in Aleppo did not come out of a vacuum; it was created by a vacuum—a vacuum of western leadership, including American and British leadership. I take responsibility, as someone who sat on the National Security Council throughout those years, and Parliament should also take its responsibility because of what it prevented being done. There were multiple opportunities to intervene. In 2012, David Petraeus, the head of the CIA, devised a plan for a much more aggressive intervention in Syria, providing lethal support to what was then clearly a moderate opposition in the Free Syrian Army. That approach was rejected. Britain provided support for flak jackets, medical kits and so forth, but it was clear throughout 2012 and 2013 that there was not a parliamentary majority in this House for providing lethal support to that opposition so that they could shoot down helicopters and aircraft, and fire back with sophisticated weaponry. In 2013, of course, this House of Commons took a decision not to back a Government motion to authorise airstrikes when Assad used chemical weapons, breaking a 100-year-old taboo—we established it in the west and it survived the second world war—that you do not use chemical weapons, as well as crossing a red line that the President of the United States had established. On the narrow point, in August 2013, we were responding to the use of chemical weapons and providing airstrikes as a demonstration that the use of those weapons was completely unacceptable and that a red line had been crossed—and, indeed, that the west had established that red line. Of course, once this House of Commons took its decision, I believe it did have an impact on American politics. We cannot have it both ways—we cannot debate issues such as Syria and then think that our decisions have no impact on the rest of the world. I think that that did cause a delay in the American Administration’s actions and did cause Congress to get cold feet. This is where I want to begin to draw my remarks to a close, because I know many Members want to speak. The last time I spoke from the Back Benches was in 2003, from the Opposition Benches, when we were debating intervention in Iraq. We all know the price of intervention. My political generation knows the price of intervention: the incredibly brave servicemen and women ​who gave their lives in Iraq and Afghanistan; the thousands of civilians who died in those conflicts; the cost to taxpayers in this country; the chaos that inevitably follows when there is intervention in a country; and, of course, the division in our society, our families and our communities. I believe, however, that we have come to a point where it is impossible to intervene anywhere—we lack the political will, as the west, to intervene. I nevertheless have some hope for what might come out from this terrible tragedy in Syria, which is that we are beginning to learn the price of not intervening. We did not intervene in Syria, and tens of thousands of people have been killed as a result while millions of refugees have been sent from their homes across the world. We have allowed a terrorist state to emerge in the form of ISIS, which we are now trying to defeat. Key allies such as Lebanon and Jordan are destabilised, and the refugee crisis has transformed the politics of Europe, allowing fascism to rise in eastern Europe and creating extremist parties in western Europe. For the first time since Henry Kissinger kicked it out of the middle east in the 1970s, Russia is back as the decisive player in that region. That is the price of not intervening. Let us have our debate, and let us do everything that we can to help the civilians of Aleppo. Let us hope that the new American Administration and the new Secretary of State work with the Russians to get the ceasefire, but let us be clear now that if we do not shape the world, we will be shaped by it. "We did not learn the right lessons from decades of war. Non-intervention is not the answer to the failures of intervention. The truth is that full-scale interventions as seen as in Afghanistan and Iraq are difficult. And so are partial interventions as we have experienced in Libya. But if anything, Syria has shown that consequences of inaction must not be ignored or forgotten, for they can sometimes have repercussions even more devastating than the choice to take action." Newcastle’s NIHR/Wellcome Trust Clinical Research Facility has been awarded £4 million by the current Conservative Government, a major funding boost to clinical research in the North East. The National Institute for Health Research (NIHR) is funded through the Department of Health, and works to improve the health and wealth of the nation through research. This £4 million is a brilliant investment into our local community, and will ensure that our research facilities have the resources and expertise to develop and evaluate cutting edge clinical interventions to benefit patients from all over the North East and beyond. The funds were awarded to Newcastle’s facilities to continue the important research that they are carrying out into dementia, conditions affecting children, diseases of the muscles and nerves, and ageing and longer term conditions. This exciting news follows another recent announcement that named the Newcastle Hospitals Trust as the top performing trust in England for the volume of clinical research carried out. Professor Julia Newton, director of the Newcastle Academic Health Partners, said: “We know that developing new and innovative treatments wouldn’t be possible without our clinical research facilities and so investment like this is invaluable”. Meanwhile, Paddy Stevenson, Newcastle’s NIHR operations manager, called this “a proud moment for our research community”; I wholeheartedly agree. Busy week of debates on the Savings Contributions Bill tonight, followed by several other debates including the standard opposition day debate on a Wednesday. I also have meetings with the RPA Minister George Eustice, to resolve outstanding claims. I and John Stevenson on Wednesday will meet with the Transport Secretary Chris Grayling. I will be heading north for the weekend probably on Thursday evening, with a packed schedule on Friday and Saturday in Tynedale. On Wednesday 23 November, the Chancellor of the Exchequer gave this year’s Autumn Statement.i wanted to set out a couple of the main points in a blog. It’s great news that the North East will benefit from the £220 million pinch point fund, with upgrades to the Hexham and Corbridge junctions on the A69. This will mean every roundabout on the many miles of the A69 from Hexham to Newcastle will be grade separated, allowing motorists a free-flowing journey. The North East will also benefit from the commitment to develop improvements identified by the Northern Trans-Pennine Routes Strategic Study by dualling the A66 from Scotch Corner to Penrith. However, from the £175 million being made available for road safety, the Government will be inviting proposals from local highway authorities to upgrade some of the most dangerous local roads, where the risk of fatal and serious collisions is highest. I will be pitching for is with the local authority. Philip Hammond, in his Autumn Statement, said: “For those who claim that the recovery is just a south-east phenomenon, I have some news: over the past year employment grew fastest in the north-east”. North East unemployment has indeed fallen and now stands at 79,000 or 6.1%. This is a decrease of 20,000 over the previous quarter (July to September 2016), and a decrease in 30,000 over the last year. Paul Carbert, of the North East England Chamber of Commerce, stated: “These figures give us positive news on the labour market in the North East. They show that participation in the labour market and the number of people in employment has increased in the past year, and unemployment has fallen by 30,000; the gap between the North East unemployment rate and the national average is at its lowest since 2010”. Indeed, figures for October 2016 show that there are now 52% less claimants – that is, someone on Job Seekers Allowance, Universal Credit, or not in work – in the Hexham constituency than there were in October 2010. This is a very substantial decrease. It proves that we are putting people back into work, contributing to a society that works for everyone. Finally, there will be an enhannced nationwide fund for new fibre infrastructure to homes and businesses. This is promising news, for a rural area of the country which has struggled to get high-speed broadband. I continue to fight for this too, having recently held productive private meetings with BT and EE in Westminster. 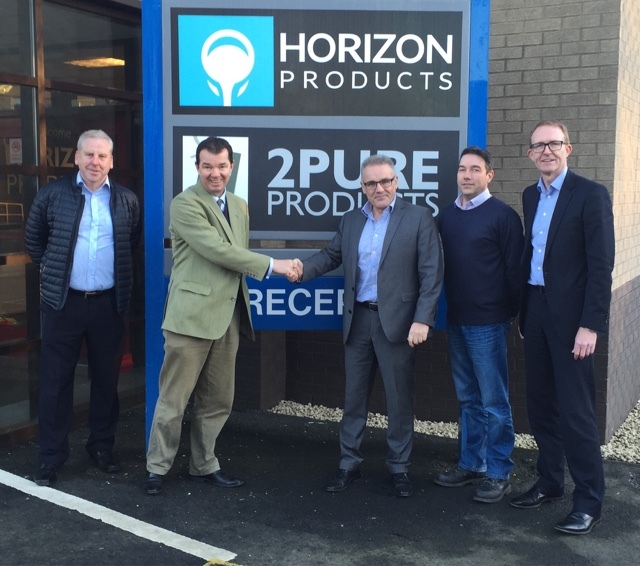 Last week I had the chance to go round the factory in Prudhoe where both Horizon and 2 Pure are based. 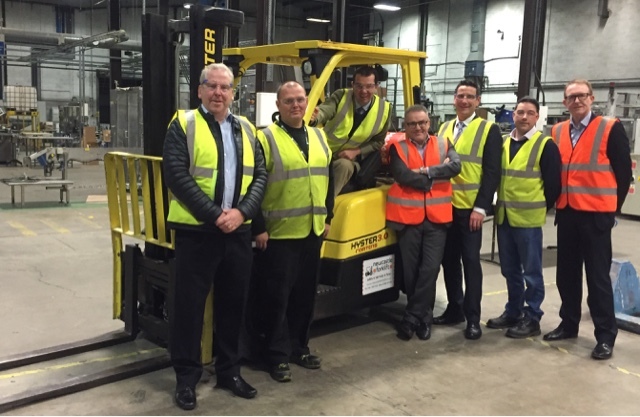 Gordon Stewart, who helps me out a lot in Prudhoe, and I met the team who work on the site and learnt about how the factory is providing local jobs, with a groundbreaking new cleaning product. The enthusiasm of the team behind 2 Pure was palpable and I am doing all I can to help their growth and exports. I believe they are going to be recruiting more people soon and it is really heartening to meet another Prudhoe based business that is expanding and providing local jobs. 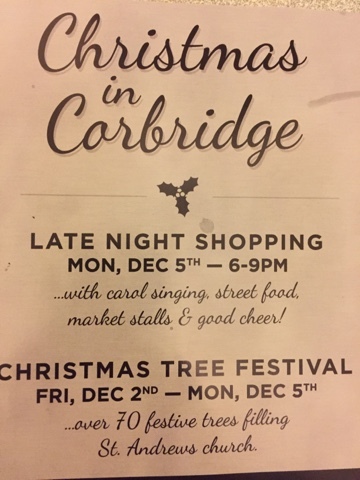 Including a huge range of festive stalls, Christmas Tree Festival, children's’ fairground, market, fair, Santa's Grotto and his reindeer and more. Download the bookmark above. DOWNLOAD your own bookmark, with events and times of this year's Christmas Market Weekend Extravaganza, as a handy pocket size calendar. Yesterdays debate was a full consideration of the merits of proceeding with Brexit by 31/3/17 by way of the triggering of article 50. There is much that needs to be done both before and after that date but we will be proceeding. The SNP, Liberals, and the 1 green MP opposites. Some of the Labour Party did not support their own motion. Ken clarke was the only conservative of 331 not to endorse the government position. I do stress that there will be multiple further debates and considerations of the way ahead. Northumberland Day Sunday May 28 - get involved! Two weeks ago I got the chance to be at the launch of the Lifesavers Project. 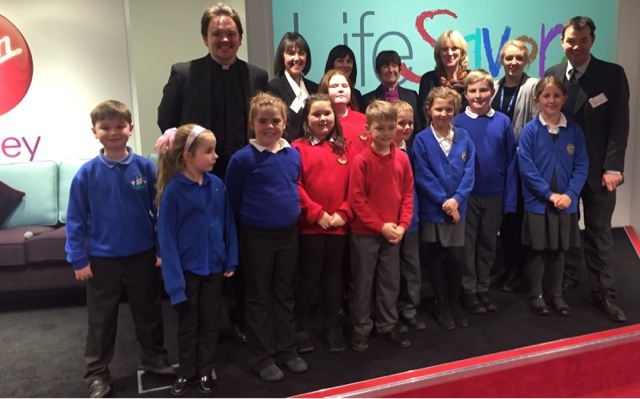 It was a star studded affair, with the Bishop of Newcastle and the Rev Benjamin Carter of Haydon Bridge welcoming many of our local schools to this groundbreaking project. In short, Tynedale Community Bank has been selected by the Church of England to provide financial education to the children of a selected number of schools - in our case Prudhoe Highfield Middle School, Hexham East First School, Shaftoe Primary, Greenhead Primary and Henshaw Primary. Many of the children and their teachers came along to the launch. The idea is that they will be taught about everything from money management to savings. We are the North East pilot and the evidence as heard at the launch of the initial pilot was phenomenally successful. And the great news is that Tynedale Community Bank is providing the local banking. Have your flu jab! I do - and your NHS needs you to get this protection: if you are entitled to the free flu jab then please get it! I need the flu jab because I had my spleen kicked to bits in a racing fall at Stratford 10 years ago - I liked the horse so much that I tried to catch it as it fell on top of me at the second last fence at Stratford races; the combination of the fall and the horse landing on me crushed my left side, broke over ten ribs, displaced some vertebrae, gave me a pneumothorax (Rib through the lung) and perforated my spleen; this damaged and perforated spleen was then taken out by a great surgeon called Mr. Mike Stellakis, at Warwick General Hospital, leaving me with a scar down my tummy, and the loss of a key element of the body's protective system. As a result I am immuno compromised. Without the operation I would have died. I did keep racing as a jockey, after a long recovery, and even raced again at Stratford, but I owe a massive debt to the NHS. The loss of my spleen puts me in a group that includes pensioners, the pregnant, and other at risk groups who need the flu jab. It is a scandal that some people who are entitled to a free flu jab are failing to take up the jab, which could save their life. Please make sure you ask your elderly relatives, or those like me who are in an at risk group, to get the jab. Some people will die or get very sick this winter because of the lack of this and it is totally wrong, and totally avoidable. The jab is free and available at all GPs. Not only is this a potential tragedy, but if people get sick through failing to have the flu jab they can occupy much needed hospital beds, with everything that this entails for both the hospital and the wider community. 3 years ago I had my jab done in less than 3 minutes by Sarah at the Haltwhistle GP Clinic. It does not hurt [much!] and will save your life!! Please make sure you check your parents, elderly relatives and neighbours have done the same thing. We have debates on the Children and social work bill today until 10pm, with debates on the health medical supplies bill and an opposition day debate on Tuesday and Wednesday. I have a series of meetings with ministers this week, including lord Nash, the education minister, and Paul Maynard the trains minister. I have constituents coming to parliament this week, and then will be heading north on Thursday, via County Durham where I am speaking on Thursday night. Many constituents have asked for guidance on this. The simplest way is to read the 2 page summary of the Brexit High Court decision: it is not, as the daily mail suggests, a decision that was an attack on the people, but in reality a return of power to the people, via their parliament. Sadly the reporting of the high court decision was very inflammatory. Parliament voted to join the EU, so parliament must vote to leave the EU. The high court is not seeking to thwart the decision of the June 23 referendum, which I for one have made clear I completely accept, as does the court; it is merely saying that we enact this decision through parliament, not by the executive power of the PM. The government is appealing this as it believes that it does not need to go back through parliament and can get on with exit via a simple decision of the PM. On Monday this discreet matter of the route of the exit will be decided by the Supreme Court. I utterly reject criticisms of the Supreme Court and high court justices, as orchestrated by the papers. But the key point of today's blog is to make the point that it is a slippery slope to attack our rule of law. Having been a lawyer for 20 years I am entirely satisfied that the decision is to be tried on its merits. The reality is that those seeking to exit the eu fought long and hard to ensure parliamentary democracy. And the judges agree. We will be leaving the eu. It is just a discussion of the means and way we do it that is being decided. This means of exit matters - namely by prime minister alone or by an act of parliament. If Prime Minister Renzi loses then it is likely we will see Italian banking and finance issues. Such events always spill over to the uk. If he then has to resign then we potentially could see another Southern European country in trouble. And we suffer every time one of our neighbours economy struggles - not least because the Italians will not be buying our exports. Looking for Christmas ideas I paid a visit to Slate and Nature, a family run business and studio, in the heart of Northumberland. The local firm, based in West Woodburn, was started five years ago by husband and wife Gerard and Jeanette Van der Veen. 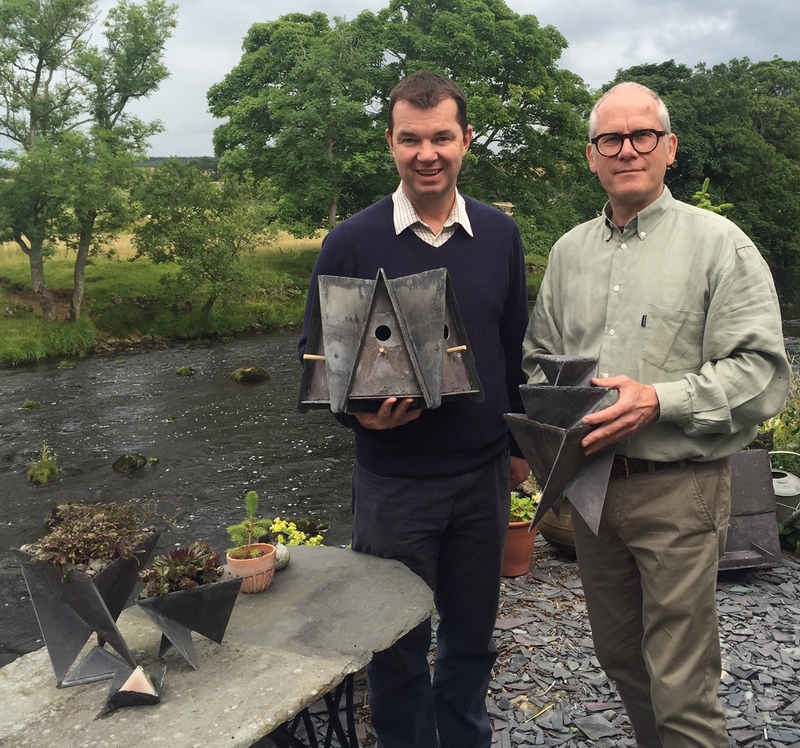 Having been awarded a European Development Grant to help with the build, the company is going from strength to strength - producing high quality home and garden products made from reclaimed slate. 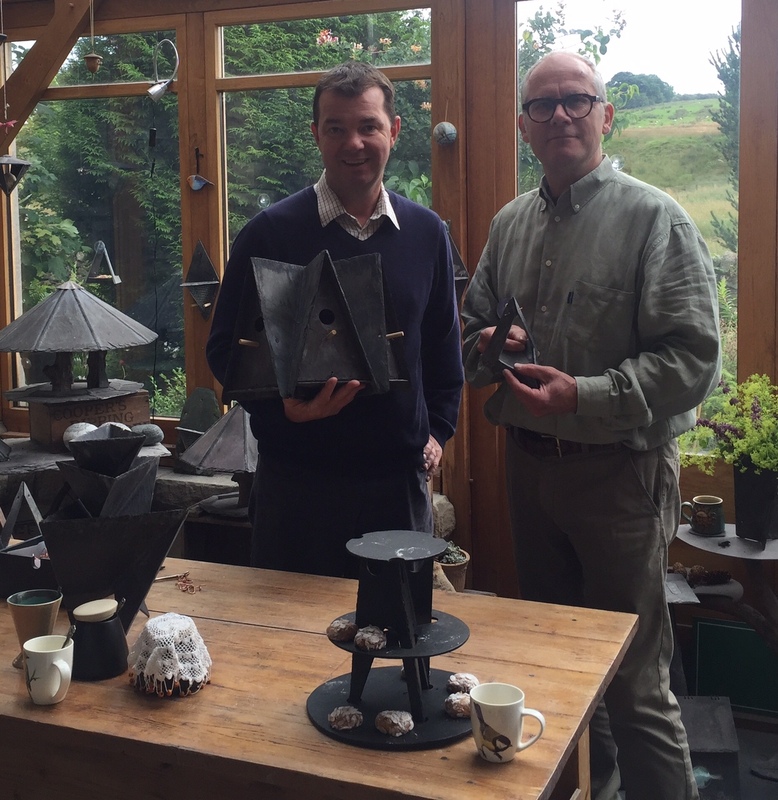 Slate and Nature is a great example of enterprise and entrepreneurship right here in Northumberland. Using only recycled or reclaimed slate, they are making fantastic pieces for the home and garden. All the material involved is re-used, so the business is also environmentally friendly! Small Business Saturday this weekend - what are you going to do to support your local small businesses? On Friday 18 November, I organised the second Flood Forum Meeting in the Tyne Valley region at the Community Centre in Hexham. Invited were the key agencies and flood groups from affected areas representing local parish councils and residents. The flood groups came from as far afield as Haydon Bridge to Haltwhistle, Corbridge to Acomb. It is right to put on record the amazing work these volunteer groups are doing for their local communities. All of us understand that the biblical floods of the 5th December last year had a massive impact on the Tyne Valley and we are working very hard to get our community ready for the future and much better informed. I asked the EA to issue area updates to specific Parish Councils – both by email and hard copy – to publicise what they are doing, and to provide contact details to enable easy communication between our communities and the Agency. I also asked that, before Christmas, the County Council and Northumbrian Water distribute maps to each affected community (via the Parish Councils and/or Flood Groups) showing who is responsible for each individual drain, and similarly providing all their relevant contact details to enable easy communication in the event of any problems. I accept that Prudhoe does not feature on this list, and will double check on any key updates elsewhere and in smaller communities but, as always, simply email teamoppy@gmail.com and I will try and get you an answer. In attendance ten days ago were key figures from the Northumberland County Council – Aaron McNeill (Flood Risk Manager) and Kris Westerby (Highways) – as well as Linzie Pendleton from Northumbrian Water, and Leila Huntington from the Environment Agency (EA). Our real big success is getting these three key agencies working hand in glove. They did this to a degree before, but the extent of integration and co-working now is both remarkable and a real credit to all involved. Aaron McNeill reported on the proposed flood gate project at Tyne Green. Flooded residents have pooled Flood Resilience Grants and, as a result, the County Council will start work in the new year on a flood gate to protect properties in the future. Aaron said that the project will need planning permission but that he does not foresee any fundamental problems with permission being granted. The County Council will be working with the EA and building on work that Northumbrian Water have already conducted on the site. 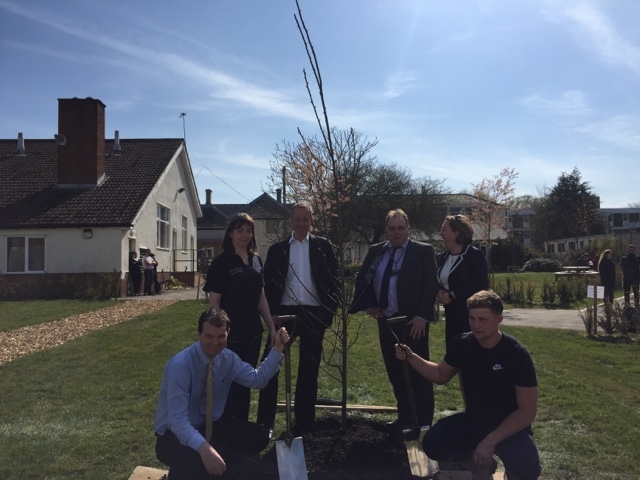 This project is an excellent example of the three individual agencies working hand in glove, co-operating to achieve tangible outcomes that genuinely make a difference. In addition, Kris Westerby announced the brilliant news that the County Council has received significant specific funding from the central government, including the allocation of £3 million for damaged road repairs. During the evening and during the day we also tried to address a number of ongoing projects and concerns, including the Haydon Bridge to Newbrough road blockage, which I visited on site, and which NCC are leading on with Network rail, and the extra repairs in places like Bywell and Eals. Linzie Pendleton provided an update on the massive cleaning and repair work that Northumbrian Water has been carrying out in various towns in our constituency. In Ovingham new linings have been put in place, and a flusher has been installed at Corbridge. Cleansing work is now being carried out in these locations. In Bywell a sewer review has been carried out upstream on the Tyne, whilst in Bellingham outflows have been checked. Leila Huntington explained that all damaged assets in the floods of December 2015/January 2016 have been restored to their original condition. Moreover, Ms Huntington and her team specifically addressed Kielder and announced key amendments to the operation of the Kielder Reservoir. Flood alleviation will now start at 80% and more water will be released in the future, resulting in at least 6-7% more storage in the reservoir. This will be an ongoing operation and will also be assessed as it is being done. The EA, Northumbrian Water and the County Council have all said that they will provide an explanation of the Kielder plan on their websites. Another, of many, important issues that was discussed at this meeting was the presence of gravel and vegetation in our local rivers. As everyone knows this is a very emotive issue with strong views on many sides. Leila Huntington, from the EA, spoke at length on the issues of the vegetation in Corbridge which has been addressed, and the extent of the remaining gravel in Haydon Bridge and Warden and the extent to which this increases or affects flood risk. Some Haydon Bridge residents have expressed that they feel the EA and the County Council are putting obstacles in the way of them removing gravel from under the bridge. The EA denied this, and there was discussion both at the meeting and afterwards by local parish council members and the EA. I have made the case, both in public and private, that we need to be fully supportive of the efforts of the Haydon Bridge PC to address this serious concern. On the opposite side of the argument there are some planning restrictions that are legitimate and the timing of ongoing extraction has to be managed by the EA. We are trying hard to get action and compliance. 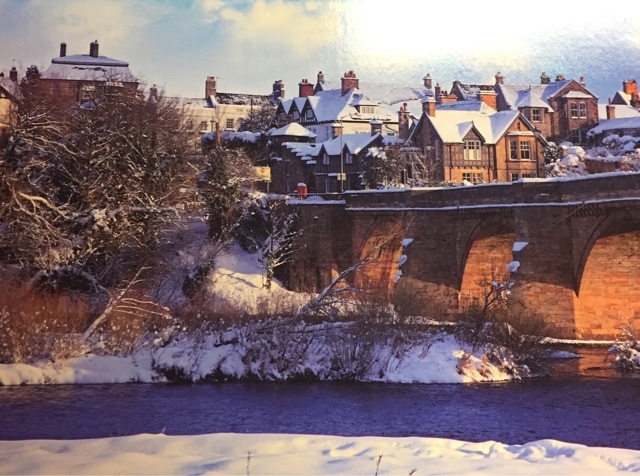 Concerns over gravel accumulations at Wark Bridge and Chollerford Bridge were also brought up, as too were fears about gravel and vegetation upstream at Ovingham and down-river at Corbridge. The EA will be carrying out a dredging impact assessment over the winter, and are reporting back to the flood groups. Any specific problems I have missed, then please get in touch by email.